In December 2007, it seemed, every major food magazine was touting the traditional joys of homemade holiday candy. This crunchy brittle is adapted from toffee recipes in Gourmet, Saveur, and Food &amp; Wine. Thickly butter a rimmed metal baking sheet. Set aside. In a heavy metal saucepan (4 to 5 quarts), melt together the butter, sugar, and salt, whisking until smooth. Over medium-high heat, bring the mixture to a boil, stirring occasionally for about 10 minutes and then constantly for 5 to 10 more minutes, until the mixture is a deep golden color (the hard-crack stage, or 300 degrees on a candy thermometer). Watch the mixture carefully during the last few minutes and stir thoroughly to prevent the mixture from burning. Immediately stir in the chopped nuts, then carefully pour the hot toffee into the center of the greased baking sheet. With a silicone or metal spatula, smooth the toffee flat until it's about ½-inch thick. Let the toffee cool for a minute or two, then sprinkle the chopped chocolate (or chocolate chips) over the surface of the toffee. When the chocolate has melted (about 4 to 5 minutes), spread it evenly across the toffee with the spatula. Place the tray of toffee in the freezer and freeze until the chocolate layer is firm, about 30 minutes. Remove from freezer and break toffee into pieces. Layer between sheets of parchment or waxed paper and store in an airtight container at room temperature; the toffee will keep for about two weeks. Since candy syrup is very hot (300 degrees), use only metal and silicone equipment for making this brittle. And be sure to soak all the utensils as soon as you've poured out the molten candy, or you'll wind up with rock-hard candy stuck to your cooking pots and tools. You can use less butter if you like, down to about 2 sticks (1/2 pound); the less you use, the clearer and harder the toffee will be. 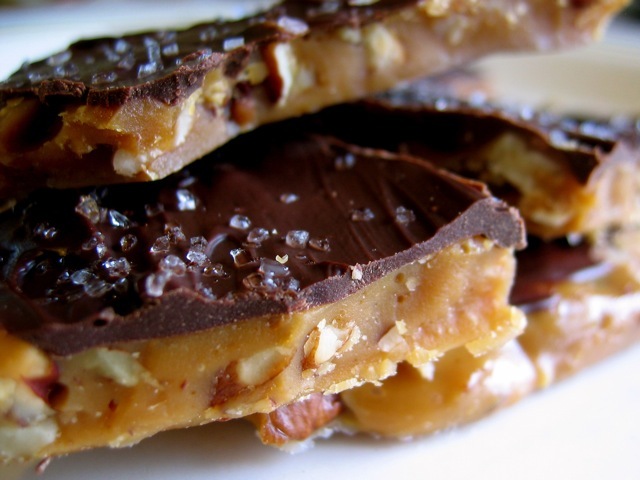 For a traditional nut brittle, simply leave out the chocolate and the salt at the end.